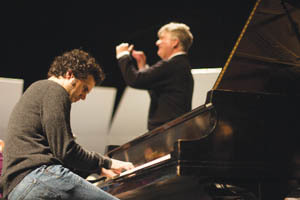 Chico News and Review: "Nasseri was brilliant"
The soloist was Soheil Nasseri, an American pianist (like Stone, he was born in Santa Monica) who despite his youth has played in prestigious concert halls around the world, including offering 20 completely different recital programs in New York City at such venues as Carnegie Hall and Lincoln Center. Schumann wrote the concerto for his wife, Clara, herself a brilliant pianist. It’s a dazzling piece full of exciting piano runs, dramatic interplay between soloist and orchestra, and lovely melodies. Nasseri was brilliant—so much so that he garnered a standing ovation from a thrilled Laxson audience.